After the last years of Safawid rule in Iran the Afghans began to play an increasingly important military rôle. Many of them were recruited by Nadir Shah Afshari to accompany him on his campaign into India in 1150-1151 H (1737-1738 AD), when he overcame the Mughals, sacked Delhi and returned to Iran with much booty, including the Peacock Throne. Among these recruits was Ahmad Khan, who may be called the founder of the state of Afghanistan. His father was leader of the Abdali tribe of Herat, which had settled around Kandahar. Having entered Nadir Shah’s service, Ahmad Khan quickly rose to a position of command. After the assassination of Nadir Shah in 1160 (1747), Ahmad Khan was elected by the Afghan soldiers to be their ruler, and from then on he saw himself as the leader of the eastern lands from Mashhad to India. Ahmad Khans aim was to consolidate his power in Afghanistan, take advantage of the anarchic situation in India by claiming for himself the lands that had been conquered by Nadir Shah, and provide employment for his turbulent followers. He was acclaimed with the name Ahmad Shah Durr-i Durran, meaning “Pearl of Pearls”, and his dynasty became known as the Durranis. Ahmad made Kandahar his capital and renamed the town Ahmadshahi. 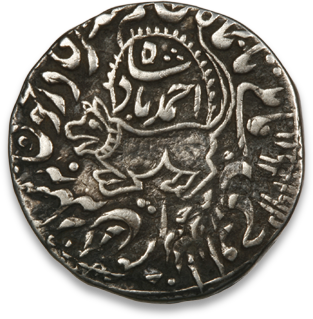 It was on the first of Ahmad Khan’s nine Indian expeditions that this special, sawa’i (1 ¼ weight) rupi was struck in the frontier town of Dira. The obverse bears the sun in Leo, the fortunate conjugation and the sign of a victorious ruler, with the long-tailed lion facing to the left and the sun’s rays rising from his back. It was probably issued as a donative coin, rather than as currency for circulation, to encourage Ahmad’s troops. 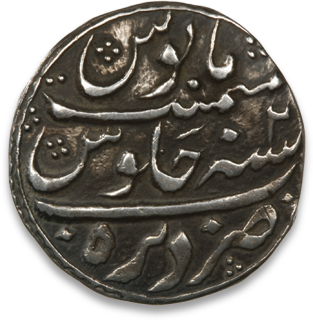 The Durranis also favoured the Persian distichs, which were so popular on the coinages of the Shahs of Iran, the Mughals and other Indian rulers.